Designed for hunting, self-defense and law enforcement applications, the XTP® delivers smash-hit stopping power. From the onset, XTP® bullets were specifically designed to expand reliably at a wide range of handgun velocities to deliver deep penetration with every shot. Hornady Pistol, .357 SIG, XTP/HP, 147 Grain, 20 Rounds is rated 4.7 out of 5 by 14. 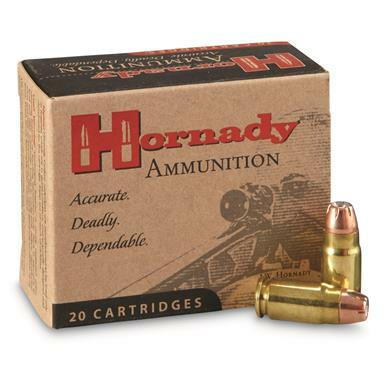 Rated 5 out of 5 by Big MO from Easy ordering, fast delivery, excellent quality rounds from Hornady. Very hot rounds with plenty of stopping power. Rated 5 out of 5 by bugs from Excellent round for Protection I got these rounds to replace my Gold Dot 125 gr HP rounds mainly because I love the 147 gr HP better. You can aways trust Hornady as well so when they dropped the price I snatched up several boxes and replaced all my mags w/ this round. I took it to the range and you can feel the difference between 125 and 147 gr bullets. Rated 5 out of 5 by bfl1981 from Excellent ammq Only ammo I carry in my Glock 32. Very accurate, never had a misfire. Rated 4 out of 5 by JERRY from I mistakenly ordered 357sig ammo instead of 357mag....my fault, now I guess I will have to go out and buy a 357sig pistol so I can use the ammo. Service was good anyway. Rated 5 out of 5 by HAROLD from I got in too big of a hurry and I ordered .357 sig when I wanted magnum. I called FED EX and had it turned around and back to SPORTSMANS GUIDE. Thank you for accepting it back. The last self-defense round you'll ever need.